I know a great book for anyone interested in ballets or theater fashion, called Ballets Russes. This book was the inspiration for my Ballet series that I started some time ago. IF's theme this week was a great reason to revisit this series and bring The Firebird to life. The ballet's story is of Prince Ivan capturing a mysterious Firebird. He trades the bird's freedom for a magical feather. If trouble ever finds him, he can use the feather to call the aid of the Firebird. A love story ensues between Prince Ivan and the beautiful Tsarevna...a monster gets involved...eggs get smashed...and the Firebird saves the day. Oh yeah, there's a wedding and Prince Ivan gets crowned. Great picture! I've listened to some pieces of the firebird, but never quite very good. Nice story. I should see it (ballet) one day, would be very nice. Wonderful! I love the story and the beautiful firebird! I was actually going to do the firebird this week, but my artistic muse was too exhausted to produce anything new. It's most definitely on the back burner for another day:> I love the look of this composition...it makes me think of a medieval painting with the flat profiles and the distant landscape. You did a gorgeous job of this! How lovely, I like the red bird. I enjoyed your website, it was easy to use and you got some great work there! 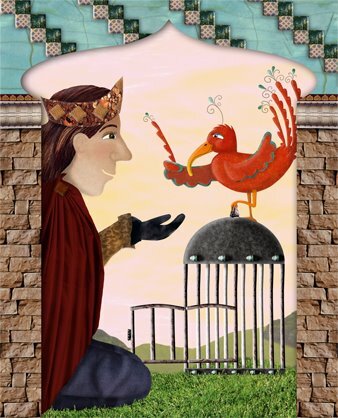 Love the rough texture of the wall and the delicate swirlies on the firebird's head and tail. Beautiful! I love it when eggs get smashed. :-) Nice job.